Officially the Warriors away jersey but it was also worn at home. This jersey was made so the Warriors could have an alternative jersey to wear after years of only having the one white coloured jersey form both home and away. 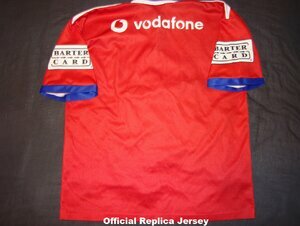 Warriors were to wear this jersey against the St George Illawarra Dragons but they brought their traditional away red jersey so the Warriors were forced to wear their actual home jersey at home. Dragons were fined $10,000 for the mix up and this was to date the last time a team has been for fined for this offence. 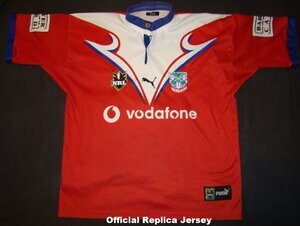 OFFICIAL REPLICA - Not to be confused with the 2008 heritage jersey which this jersey was the inspiration for. Biggest give away is the missing Centary badge. The standard replica is relatively rare and they hardly come up for sale on online. They still fetch good prices because of this. PLAYERS JERSEY - Same as the replica but had no sleeve sponsor. The Barter Card logo was a large badge that was sewn on. You'll find some with or without the badge.